Not museum pieces, but working boats. It put spruce gum out of business and was once a dominant brand name in the canoe industry. The famed Cree canoe factory at Rupert's House with roots in the fur brigades. 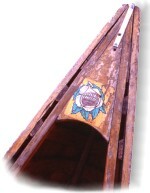 The best web site on wooden canoes. World's largest collection of canoes.